When I first moved to New York City from my hometown of Boulder, Colorado at 22-years-old I had never really done much by myself. I didn’t know many people there, my roommate had a busy work schedule, and so it was that I often found myself with time to do things but nobody to do them with. I had to get over the embarrassment I felt before I could get comfortable doing stuff alone. My inner-critic would tell me things like people will think you don’t have any friends, people will think you don’t have a social life, people will know you don’t have a boyfriend, you get the point. Our self-talk can be so cruel and limiting. What I have learned with age is we are so consumed with our own life but really, nobody else is. The majority of people don’t think twice when they see someone out by themselves because they are focused on their own lives, and the small fraction of people who do think it’s odd, well, who cares? Why would it matter if someone thought it was weird to see me at a restaurant alone or going on a trip without a companion? It doesn’t. Once I got secure and confident flying solo I felt less of the restriction of having to wait for people to do the things I wanted to do and instead just did them! Now at 30, I look forward to doing things by myself. It’s a chance to be on my own schedule, to be with my own thoughts, and to connect with the deepest parts of myself. My fiancé and I both value time alone, and even though we live together and spend the majority of our time together, we make sure to schedule in some solo hours every week to decompress and rebuild our energy (can you tell we are both introverts?). 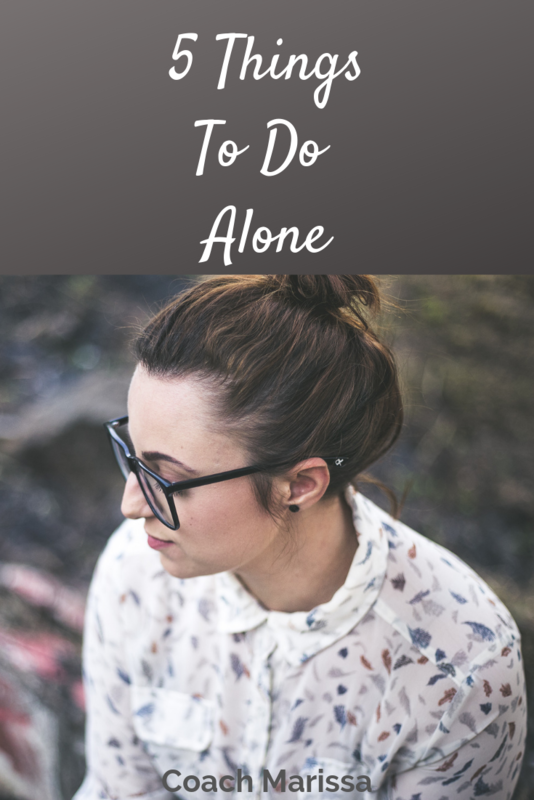 Whether you do things on your own all the time or have never done more than walked to the car by yourself, here are 5 of my favorite things to do solo. Give them a try! I hope alone time can start to feel (if it doesn’t already), empowering, connecting, and rejuvenating for you. If you’ve had some of those insecurities that I mentioned about venturing out alone, then a movie is a great thing to start with. When you go to a movie it’s dark and you can’t really talk to anyone anyway, so it’s a perfect thing to enjoy solo. I started going to movies in New York by myself and loved it. I could see the movie I wanted to see, when I wanted to see it. I didn’t have to do the “assessment” after with my companion of what we both thought and compare notes. Instead I just got to enjoy it. Walking is a simple, delightful activity to do solo. Or running for that matter. When we are alone, it is so easy to fill that space with noise by turning on a podcast, starting your favorite Spotify playlist, or calling a friend to catch up. Those are all good, and certainly an enjoyable way to spend a walk sometimes, but I invite you to try walking without anything in your ears. I notice when I walk in silence alone it is amazing what I hear. I am more tuned in to the sounds in nature, an overheard conversation, and most of all my own thoughts. I could spend HOURS in a bookstore or a library, and that’s why going solo is so fun. How often do you let yourself take as much time as you want doing something like that? What if you just browsed the shelves, picked a few books that caught your eye, found an armchair to sit in and read the first few pages of each one? What a lovely way to spend an afternoon. Going out to eat can be an intimidating solo activity, especially at a more formal restaurant. What I find makes it a little easier and even more fun is to sit at the bar. That way, you don’t feel the void of being alone at a table, but it also can invite conversation with the other people sitting at the bar or with the bartender. I often bring a book as a security blanket or my phone, but usually don’t even need to pull it out! If you have thought of traveling solo but are afraid to take the plunge of backpacking through Southeast Asia alone for a month (I get it, that’s a lot), start smaller! Try going away for one night alone. Pick a destination close by and find an airbnb or hotel to stay in that feels like a treat. Walk around, go out to dinner, journal, pop into stores. See what that’s like. Then build. Go away for a whole weekend alone. Try flying somewhere instead of driving. You will get braver and braver the more you do it. Some of my favorite memories of trips have been solo trips but I started with just a night or two alone and worked up to a few weeks in Europe. So start adding some more solo time on your calendar, or if there is a lot of solo time already, don’t be afraid to get out and do fun things by yourself! Schedule a date just with YOU this week and see how it feels. You might be surprised by how much you enjoy the time.